Before he gained wide fame as a novelist, Ernest Hemingway established his literary reputation with his short stories. 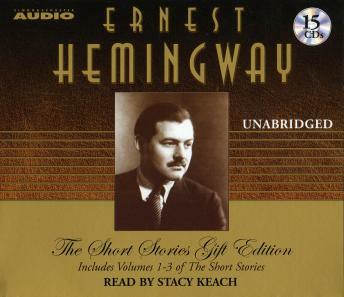 Set in the varied landscapes of Spain, Africa, and the American Midwest, this definitive audio collection traces the development and maturation of Hemingway's distinct and revolutionary storytelling style -- from the plain bald language of his first story to his mastery of seamless prose that contained a spare, eloquent pathos, as well as a sense of expansive solitude. These stories showcase the singular talent of a master, the most important American writer of the twentieth century. The Short Happy Life of Francis Macomber; The Snows of Kilimanjaro; The Doctor and the Doctor's Wife; The End of Something; My Old Man; Hills Like White Elephants; The Killers; Ten Indians; Now I Lay Me; A Clean, Well-lighted Place; A Way You'll Never Be; The Gambler; and Fathers and Sons. These stories are magnificently read by Stacey Keach who truly expresses the multitude of characters depicted. I gained a great insight into areas of war I had not known and heard the influence of Gertrude Stein in a way I had not noticed reading Hemingway.